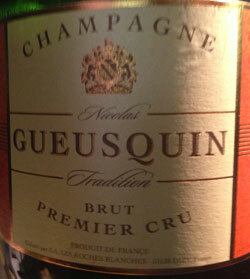 Champagne Nicolas Gueusquin is a negociant founded in 1994 in Dizy, Marne. I encountered one of their wines on United Airlines flying from the US to Dubai and rather liked it. There is very little information available about Gueusquin and their one page Web site has been "under construction" since 1998 but it does have contact information listed. They are rapidly expanding, having moved to new facilities in Oiry recently for more space. Although they own 10 hectares of vines, most of their grapes are purchased and they produce a few million bottles (around 6 million by some estimates) a year. Nicolas Gueusquin sells primarily to supermarkets and wholesalers, and the term "Supermarket Champagne" has been used to describe them. Although one might take this as a derogatory statement, I do not as Champagne should be available to the masses, and quite honestly most people buy their wine in supermarkets. They export a lot of wine to West Africa, Japan, and Europe. An airplane is not the ideal place to drink and evaluate wines, but there are worse places to be than United Business Class from Washington DC to Dubai and this Champagne did show quite well. In fact I enjoyed several glasses. It may rate a slightly higher score. The nose was apples with a wee bit of baked bread, spicy and long chalk, minerals, a bit of lemon. On the palate it was fruit forward with apples, a touch of orange, sweet lemon, and mango. Very pleasant although not very complex.